Say what you will about the slasher subgenre of horror, it can’t be faulted for a lack of narrative economy. The typical method of storytelling, in which a group of people (usually young and attractive) are stalked and killed by some mysterious nemesis, rarely goes much beyond a 90-minute exercise in gore and the mechanics of killing, with character development and scene-building a distant third. Efforts to translate this structure to the longer format of episodic television have met with results both moderately successful and supremely less so. Wolf Creek, the latest effort to turn a relentless killer and a plucky final girl into a serialized story, has the leg up of an established and charismatic antagonist. What it lacks, unfortunately, is the know-how to transform this story into well-crafted episodic television. The 2005 horror movie from writer-director Greg McLean has earned a cult following, thanks in part to its relentlessly dark and tense pacing, as an offbeat Aussie poacher named Mick (John Jarratt) offers aid to a trio of vacationing twentysomethings, only to reveal himself as a sadistic killer who has haunted the outback for decades. But equal credit should go to Jarratt’s outsized villain, a cracked monster who laughs at the world even as he’s methodically hunting and killing unwitting victims. Following the lackluster sequel, McLean and Jarratt are back in this six-episode limited series from Pop TV, turning over the majority of the narrative to a determined young woman (11.22.63’s Lucy Fry), a decision that makes for smart storytelling but hampered by an inability to effectively break up her journey over the course of the show. Many of the flaws stem from a frustratingly inconsistent narrative. The series can’t decide if it wants to be a single heart-pounding tale of revenge, or a more meditative and sprawling journey throughout the remote Australian countryside. The revenge is set in motion when Jarratt’s Mick saves the son of a vacationing American family from a crocodile, only to have his good deed quickly reveal itself as nothing but an excuse to drink and toy with his victims for several hours before killing them all—all save Eve (Fry), a college student who miraculously survives being shot, and escapes downriver to safety and rescue. Ignoring the orders of Sullivan (Dustin Clare), the cop investigating the crime, to fly home, Eve disappears in the wilds of small town Aussie life, determined to locate her family’s killer and take him out. As she digs into the background of Mick’s victims, she uncovers the secret history of disappearances throughout the country—disappearances she intends to put a stop to by murdering the man responsible. 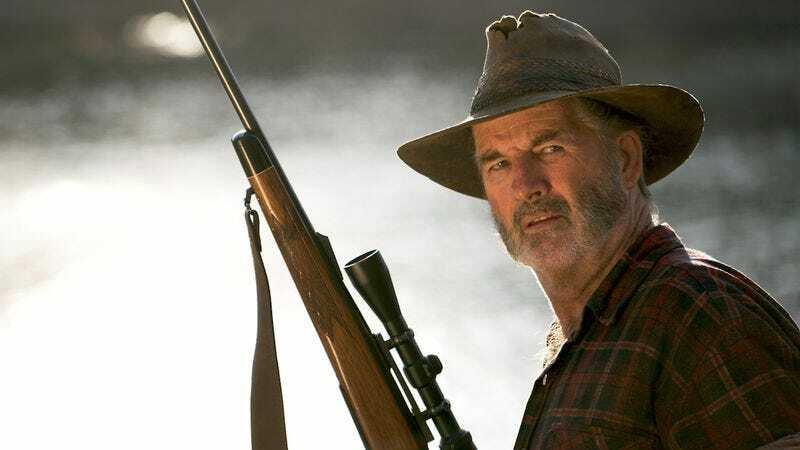 It’s a solid premise for a series, especially a limited one like this, but despite the short run, Wolf Creek can’t figure out a reliable execution, the various episodes scattered like so many disparate body parts from Mick’s prey. Halfway through the show, Eve’s proximity to unrelated complications and unlikely fatalities have already taken on Jessica Fletcher-esque levels of coincidence. There are people who have nothing to do with either Eve or Mick that get pulled into the arc of the narrative, even as their storylines barely skirt the edge of relevancy and are more distractions than anything. The fourth episode suggests the serialized turn a longer series might have taken (Eve goes to visit the family of one of Mick’s long-ago victims and gets more than she bargained for), essentially a stand-alone tale in the midst of an otherwise streamlined affair. Soon, the show is insisting Eve has developed close relationships with people she hadn’t even met one episode earlier, and trying to force an unearned intimacy between her and the cop pursuing her while trying to locate the killer. And that spotty narrative momentum robs subplots and supporting characters of much intrigue. A barely there marital conflict between Sullivan and his wife never gets enough time or explanation to create investment in the outcome, and the introduction of an escaped prisoner (Jake Ryan, who smolders with the intensity of an Aussie Michael Fassbender) barely even has time to make sense before it’s resolved. Instead, the episode is best served when it focuses on Eve and the people she fleetingly encounters en route to her showdown with inevitability. Fry imbues Eve with soul beyond a superficial haunted-but-tough vibe, and even when the show does her character no favors (a “weapon training” montage featuring the stock mystical native mentor is especially clumsy), she gives layers to this damaged young woman. That the show is so watchable despite its flaws is a testament to her charisma and committed performance. The other selling point of Wolf Creek is the setting and cinematography. Even though it looks shot on low-budget digital cameras that don’t do justice to the natural beauty, the various directors capture the austere landscape and create cinematography that evokes both the harsh environs and spare poetry of the rural setting. It makes up for the show’s lack of confidence in its storytelling prowess. The third episode opens with a flashback to one of Mick’s murders from more than half a decade prior, as though worried the audience will get bored if they don’t get to see the bad guy spill some blood every so often, relevance be damned. It happens so often, even Jarratt seems bored with it at points, dispatching one woman as though he were a day laborer grumbling about the weather. Still, by the end we’ve spent enough time with Eve that the climactic showdown can’t help but be somewhat satisfying. The wronged woman seeking justice may be a common trope, but it’s an effective one in the hands of a gifted actor like Fry. It’s comforting when it ends, and not just because the maddeningly loose story can’t effectively fit the medium in which it lives. Like a random episode of Law & Order: SVU, Wolf Creek isn’t great writing, unevenly starting and stopping a half-dozen stories en route to the end; but once it begins, you need that resolution to be satisfied.